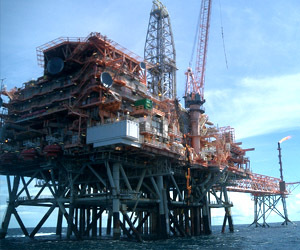 The off-shore platforms are mainly dedicated to oil and gas extraction. These offshore platforms have all the systems required to undertake this work and to accommodate its employees in good living conditions. Being at sea, they should operate as independently as possible from the coast, so they contain complex facilities for generating electricity and storing fuel. Proper fire protection is very important in these spaces because the facilities are very expensive and evacuating personnel in the event of a fire can prove very difficult. The offshore location makes it very difficult for external extinction means to access it, so the oil rig should be properly designed to prevent potential hazards and be able to extinguish any fire outbreak with available resources. The way of installing the extinguishing media must also be examined in order to save the maximum amount of space occupied by them. The main areas to be protected on a platform with automatic extinguishing are: diesel generators, technical rooms, computer rooms, paint rooms, workshops, diesel storage tanks, oil tanks, electrical panel rooms, electrical transformers, control rooms, battery rooms, refrigeration rooms and high or low voltage rooms. All these places are an important source of possible fires that can severely damage the platform.